On Thursday 10th December, there will be a health check day for Brent people with a learning disability aged 14+, their carers, health and social care workers. You can come all day or for 1 or 2 hours but you must book before. In the Government’s latest Disability and Health Employment Strategy, Brent’s transitions service has been quoted as an exemplar case study example. We recently hosted a Hidden Heroes event at the new Brent Civic Centre which was well attended and received by all. It championed disabled people in the Borough. A video clip of the event is below. Our Safeguarding service at Brent Council is one of the hidden gems in our service portfolio. Not quite as obvious as the bin in front of your house or the streetlights on your road, but Safeguarding in Brent is widely respected as one of the best in the country. Abuse is not just physical, but also emotional and financial. It is everyone’s responsibility to do what they can to stop it. The number of reported cases of abuse of adults in Brent has risen from 435 in 2011-12 to 664 at the start of 2013, we fear the real figure may be far higher. Even with the increase in reporting of incidents, inevitably, abuse of adults in all categories is still largely unnoticed and under-reported. 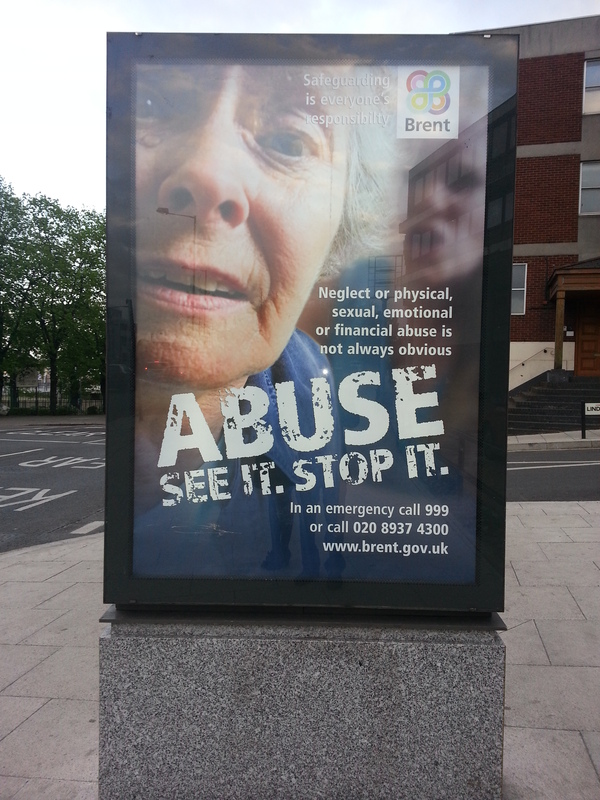 That is why we are promoting our Safeguarding service through a Borough-wide poster campaign. You may have seen images like the one below advertised near you.